We often cover many activity tracker in our blog. We think of it as a simple yet effective way to give you that extra push to keep moving and reach your fitness goals. Fitbit trackers have been a popular choice of many of our readers, and they’ve definitely chosen wisely. But if you’re still not 100% sure, we give you another great option to look at: the Misfit Shine activity tracker and sleep monitor. In this post, we’ll be reviewing the details and features of the Misfit Shine and compare it to other trackers like Fitbit Flex and Charge. The Misfit App and Its Compatibility. Comparison with Fitbit Flex and Charge. Which Tracker Should You Get. Common Questions About Misfit Shine. Small and lightweight activity tracker and sleep monitor. Made of anodized aircraft grade aluminum. Halo of lights shows you how you’re progressing. Can be worn anywhere, either as a band around the wrist or clipped on your clothes/pocket or even as a necklace. Ability to monitor and analyze sleep quality. Tracks a number of activities including: walking, running, swimming, cycling, basketball and more. Measures calories burned and distance. Does not need charging, battery lasts up to 6 months. Has its own app and connects with many other fitness apps. 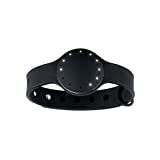 Click here to learn more about Misfit Shine, read the customer reviews and buy it. Set how many hours you want to sleep – Sleep goal. View how many calories you’ve burned. View the distance you’ve walked. Log your meals with the Food Journal. View the quality of your sleep, how much you’ve spent in light or restful sleep or how many hours you’ve been awake. Share the progress of your friends. Is the application compatible with iOS and Android? Yes, it is compatible with all iOS, Android and Windows phone devices. You can run it on iOS 7 and above, and Android 4.3 (Jelly Bean) and above. All devices must have Bluetooth 4.0. The Misfit Shine syncs wirelessly with your phone/ tablet via Bluetooth. It does not have to be connected to the phone all the time, but whenever you’re done with your daily activities, you can connect it and sync all the data at once. In fact, the Shine stores data up to 30 days, so you don’t have to sync it everyday. However, you need to sync it before the 30 days are up so you don’t lose those days data. As mentioned above, the Shine syncs with its own app or other fitness devices like Lose It!, RunKeeper, My Fitness Pal and more. Does the Misfit Shine Has a Watch Function? Yes, it does. It uses the LEDs to show time. It does not have any numbers on the display. a clip which you can use instead of the band to attach the tracker anywhere. Battery and batter removal tool. Misfit Shine vs. Fitbit Flex and Charge, Which Should You Choose? Please visit this post to learn the difference between the Fitbit Flex and Charge. Halo of lights show you how active you've been throughout the day. Tells time using elegant, minimalist interface. Wrist Band is included. The Misfit Shine is closer in design to the Fitbit Flex with their minimal approach. Both of these trackers using LED lights to show you your progress. The Fitbit Flex does not have a watch function like the Shine. The Fitbit Flex requires charging via USB. The battery has a life of about 5 days. The Fitbit Flex has a silent alarm function, which means it vibrates in your wrist to wake you up. On the other hand, the Shine doesn’t vibrate, but the Misfit app has a Smart Alarm function which wakes you up when you’re at your light sleep cycle so you wake up refreshed. The display shows time, so it works as a watch at all time. The progress is shown in numbers and not just LED lights. So you know exactly how many steps you’ve taken and how many calories you’ve burned without the need for the app. You get all your stats in real-time. It also counts how many stairs you’ve climbed. It has caller ID which is also shown on the display. The battery life is about 7 days. Which One Is The Best To Get? If you’re looking for basic tracking features, both the Misfit Shine and Fitbit Flex are excellent choices. The one advantage the Fitbit Flex can give you is that it can sync your data using a computer too and not just the app, and you can analyze your progress using a web-based app. If you’re looking for real-time stats, and don’t want to sync your data in order to see details of your workout, the Fitbit Charge is your best choice. It also gives you the benefits of a called ID and phone notifications and an actual watch. Does Misfit Shine Work with iPhone 4? No, it does not. It will work with iPhone 4S though which has the minimum requirement for iOS and Bluetooth. Does It Work with All iOS and Android Devices? It will work if you have as least iOS 7 and Android 4.3 (jelly bean). It does, provided it has iOS 7 and above and Bluetooth 4.0. That basically means: iPad 3, iPad Air and Mini. It will not work with iPad 2 as it doesn’t have Bluetooth 4. Does the Misfit Shine Vibrate? Does It Tell Time and Does It Track Heart Rate? It does not vibrate, if you’re looking for silent alarms (vibration), the Fitbit Flex will be a better choice for you. It does tell time, but it can be a little complicated. It uses the same LEDs that show you your progress to tell time. It does NOT track hear rate monitor. If that’s what you’re looking for, have a look at the Polar monitors or Fitbit Charge HR. How To Tell time on the Misfit Shine? Does It Track Sleep and Calories? Is The Misfit Shine Waterproof? Yes, and it’s able to track swimming. It is 50M waterproof.